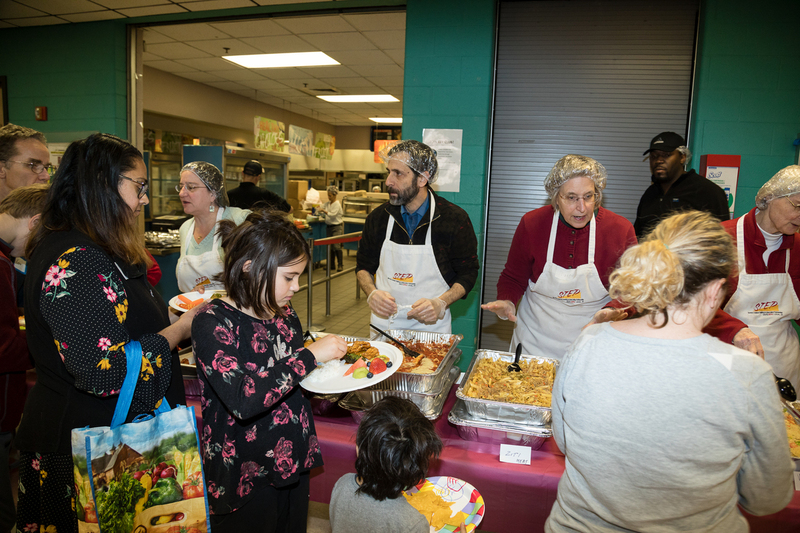 Furloughed Workers In Hard-Hit Community Gather For Potluck During Shutdown Friday evening, as the shutdown bordered on becoming the longest in U.S. history, hundreds of furloughed workers gathered in Montgomery County, Md., to share a meal. Volunteers hand out food to furloughed workers and their family at a community potluck. The cafeteria in Montgomery Blair High School was packed last Friday, but not with students. 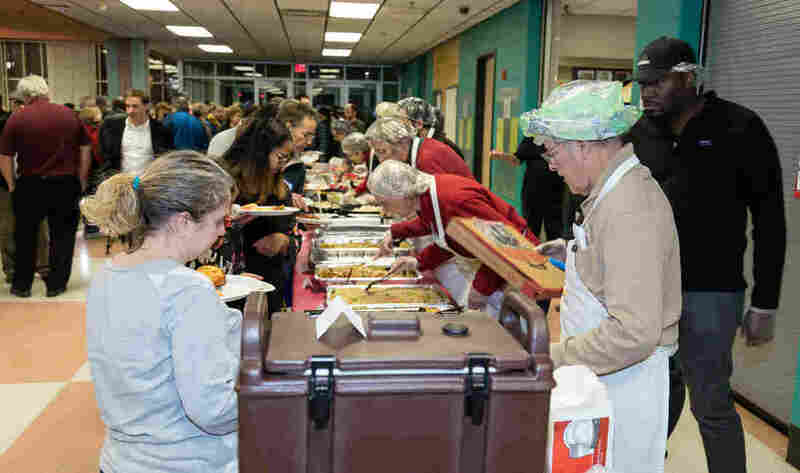 After enduring more than three weeks of the ongoing partial government shutdown, hundreds of furloughed workers gathered in the Montgomery County, Md., high school to share a meal. The potluck of hearty foods such as ravioli, pizza and chicken — whatever people in the community had to donate — fed well more than 600 workers who are feeling the financial strain of missing a paycheck. There was plenty of dessert too. The meal was especially sweet for many, considering the circumstances. Just outside of Washington, Montgomery County is home to at least 750,000 federal employees, so even those who aren't furloughed are feeling the ripple effect in the community. 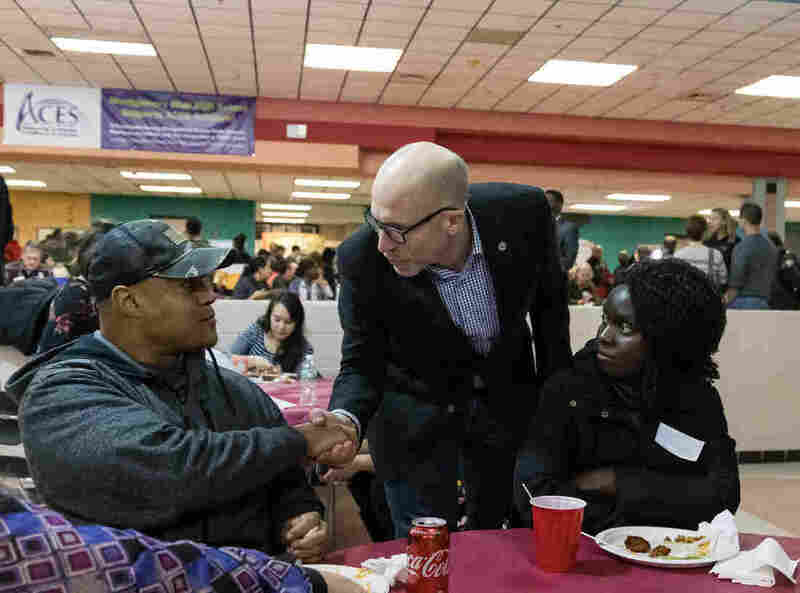 Montgomery County Council Member Tom Hucker decided to organize the potluck, called the Shutdown Social, to help furloughed workers get out of the house and get their minds off of the shutdown. Montgomery County Council Member Tom Hucker checks in with furloughed workers at a community potluck he organized. That's exactly why Melinda Batson, who works at the Food and Drug Administration, decided to show up. Her last paycheck showed nothing but zeros. "It does something mentally to you, to look at a paycheck and all you see is zeros," she said. "It's nice to get out, but it's sad to see the faces of public service sitting down, taking a meal. For some people this might be their only meal." Hucker was shocked at the event's turnout, which had only been announced the prior Monday. He said he realized that even for those with good jobs, missing three weeks of pay was heavily affecting people's lives. "They are staying home every night, they haven't gone out to dinner, they're eating fish sticks in the bottom of the freezer," he said. Staying at home, unsure of when she can return to work and unable to go out and spend money, is making resident Roberta Long feel stir crazy. The youngest of her two sons, who is 4 years old, also is getting antsy. Normally he attends day care at the National Institute of Standards and Technology, where Long works as an IT specialist. But the government shutdown doesn't just mean no work for Long — it also means no day care. Spending 24/7 with her spirited youngster is wearing her thin. "It's been mad, it's just been like utter chaos," she said as her energetic son ran around the cafeteria. Looking at her son she added, "That's not sugar, that's just life." Her son was having a blast, so she and her husband agreed it was good for him to get out of the house. In the background, lively drumming from local high school musicians kept the energy and spirits in the room high. Sen. Chris Van Hollen, D-Md., made an appearance at the event after pushing legislation to give furloughed federal workers back pay, which passed in the Senate on Thursday and in the House on Friday. The bill guarantees that federal workers eventually will be paid for the time they were furloughed and is awaiting a White House signature. "I was pleased ... to at least take the cloud of uncertainty away from federal employees and guarantee that when this shameful shutdown ends they will be paid in full, but what they really want to do is get back to work for the American people, so let's keep pushing," he said. 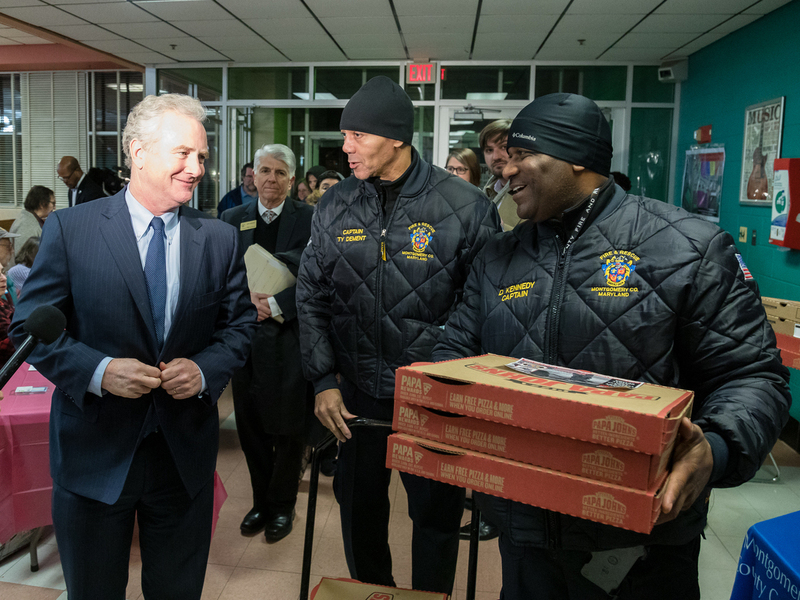 Sen. Chris Van Hollen and local firefighters showed support for furloughed workers at a community potluck. Others in the area who aren't directly impacted by the shutdown also came to show support. Dozens of volunteers and sponsors helped make the event happen, including 17 local restaurants donating food, and local firefighters who came in carrying boxes of pizza. Local resident Marilyn Opitz said many others in the community are indirectly impacted — either they know someone who is currently furloughed, or their business is suffering as a result. The latter is the case for Opitz, who works as a hairstylist and makeup artist. She said many furloughed workers are her clients, and now they're canceling appointments. "It trickles down," she said, speaking about the shutdown's impact. "If you live here long enough, you're going to be affected by it." Opitz watches the news every day to check for updates on the shutdown. So does Long. But Long is not feeling optimistic. "I'm trying to make sense of it," she sighed. "I feel like there's not even an end in sight."